If you love the thrill of games even when you can’t really go out, you’ll no doubt love playing air hockey. The excitement and challenge of this intense game is greatly enhanced when you have the right playing equipment that lets you go the extra mile with your sport. Air hockey tables are the perfect choice if you have a small party where you wish to include some fun games, or simply if you’re hanging out with your buddies and would love to enjoy a match indoors. Getting the right gaming accessories is crucial if you are to enjoy this sport. With the many dealers and manufacturers of air hockey tables out there, how do you really make the right choice? Well, the choice is easier with a bit of help. Here are the best air hockey tables reviews that will help you make a choice that is perfect for you, for your home and for your family. Put an end to the preconceived notion that only larger air hockey tables are ideal. This neat 40-inch table is durable, easy to maintain and perfect especially for younger children. It comes with a strong hardwood frame that mounts atop any table and features a 100 CFM air-powered motor. You’ll also get two strikers and pucks with this table so that you can get started with your favorite game of air hockey right away. 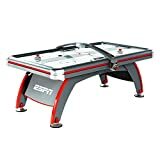 This brilliantly compact three-in-one air hockey table certainly gives you good value for money, since you not only get to play air hockey at this table, but also table tennis and billiards. The billiards surface includes rubber bumpers, drop pockets and a Tetolon green cloth while the table tennis surface features a trifold table top that you can use for simple storage. The air hockey surface features a glossy white playing surface, a manual scoring system and a high output blower for better puck motion. You also get four pucks and pushers, a resin triangle, a set of billiard balls, cues, brushes, chalk and two table tennis balls and paddles, apart from the net and post. You’ll need to spend a bit of time assembling this unit but it is certainly time well-spent. Get ready for intense action with your favorite sport with this classic arcade-style air hockey table. This sleek 82-inch long table features a 120V motor that produces ample air flow for consistent puck action. It lets you enjoy your game even in the dark, thanks to the LED Lumen-X technology that lights up the table with blue, green and red lighting effects that change throughout the game. The table sits on four sturdy legs so you can go wild with your game and make it really intense, without having to worry about the table crashing. Bring home the convenience of compactness with this neat air hockey table that takes up quite little of your living space but still adds so much to it. It is neither too large nor is it too small and features vibrant graphics to make your game more interesting. 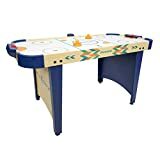 You get quite a lot of free accessories with this table – a battery-operated, electronic scoring unit, two sets of orange paddles and pucks, as well as neat leg levers that let you adjust the legs so that your game is not hindered by table height. It includes a 100V electric blower that gives you control over puck movement without hindrance. Enjoy the excitement of your next air hockey game when you bring home this 5-foot environmentally safe table. This sturdy table comes with a side panel that keeps it in place even when your game gets intense, while the leg legers ensure that you get the table to its perfect height. The table includes an 110V blower fan for the best possible air flow to let your puck glide over its poly-sealed, slick playing surface. Use the included electronic scoring system to track your game with friends or family at your next get-together. Reinforce your game of air hockey with this 84-inch table from EA Sports that combines old-fashion fun with some intense gaming action. Enjoy the LED electronic scorer overhead that includes a timer and sound effects to add that extra fun to your game. It comes with friction-reducing, air-powered push button controls to simplify your game, as well as leg levers that let you get the perfect playing surface level. The table comes with a reinforced top rail and playfield apron that promote stability and durability. Enjoy a drink while you play your game and place your drink in the built-in cup holder while you take your shot. 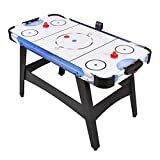 Add a bit of extra fun to your air hockey game with this electric powered, compact table that sits neatly on tabletops, floors or any other furniture, letting you take your game with you. 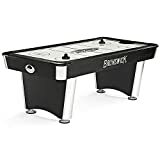 This air hockey table includes two pucks and pushers, a high-output fan for fast action and goal boxes with manual scorers. The table is easy to pack and store away when not in use and its high quality wood makes it durable, while the rubber padded feet prevent it from scratching your furniture. Take your air hockey game to a whole new level with this solid, 7-foot table. This sleek and sturdy table is perfect for the more serious gamer and includes a constant blower for smooth puck movement. You get four pucks and two mallets with the table and its laminate over MDF body ensures that it is a durable investment. Liven up your living room with fun and laughter with this 40-inch air hockey table that is ideal for the entire family. The table is compact and doesn’t take up much space in your home, and is also portable and easy to store. Its low height makes it perfect for even kids to enjoy, and it comes complete with two strikers and pucks so that you can get started with the game right away! 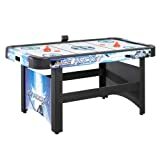 Enjoy events and gatherings with friends and family with a lively game of air hockey, with a bit of help from this 54-inch indoor table. Perfect for kids or anyone who loves to have fun, this air powered table is ideal for any home. 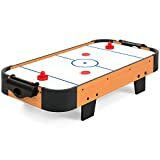 It includes a 12V motor that provides steady air flow for better air hockey action, while its special surface coating lets the puck glide smoothly. The table includes a manual or electronic scorer, and two pushers, pucks, felt pads and goal boxes.